Broker Sponsorship service for Realtors is tailored for the independent agent. We provide all the tools and training you need in order to be confident in your success. What all needs to be done to change brokers? First, you need to speak with your current broker and make them aware of your switching. The main reason for the conversation is to make sure there is an understanding of who the current transactions are owned by, and whether the broker is going to honor the commission after you leave. If you have already done this, then the process is quite simple. We have a transfer form that we will provide you after you accept the invitation and it this will take care of changing boards and/or brokers at the same time. Are leads provided for residential sales? Currently there are no lead sources for residential sales. The capability is in place to be able to sell and buy leads within the company but as it stands there are no lead sources. 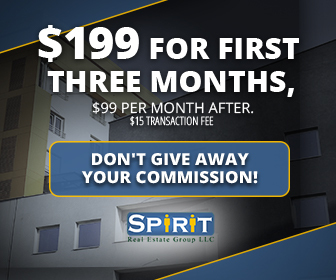 Property management is permitted through the Spirit brokerage. You cannot PM under a different name, and you are required to use our software. Currently we are using Buildium to manage our properties. The rent checks and deposits are made payable to Spirit and they are held in a trust account. Your fees and costs are deducted and sent to your operating account, and the distributions to the landlord and tenant are handled by Spirit. Please see our property management page for more information.